With a colorful palette and subtle impasto Simon Kramer creates the entire atmosphere of a Paris street with people moving among the buildings, some with hotels, some with cafes and the street with the hustling and bustling we love in Paris. Simon Kramer is a well listed Dutch artist who is especially loved for his impressionist style Paris works. The painting measures 16 x 20 in. without frame and 24 x 28 in. including frame. 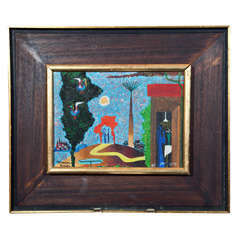 The painting is housed in a midcentury giltwood frame, with a wide canvas liner. Some wear and discoloration to the frame. 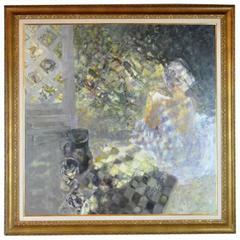 Louis Fabien (1924) French Impressionist. Wally Findlay Galleries was the original seller. Unusual scene. Measuring frame: 47" x 47". 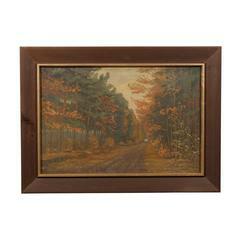 Bar scene or music scene painting, oil on canvas in painted wood frame, mid-20th century. Signed on the back stretcher bar P Archer. An oil on board by Israeli artist, Yohanan Simon, depicting figures at the altar and birds in a tree. 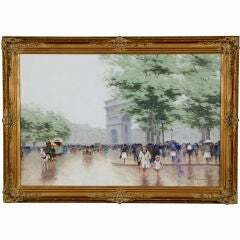 In its original frame.